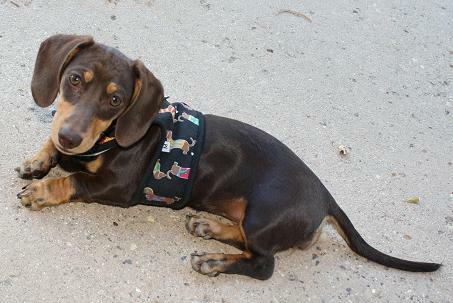 We want to say Thank you to all Our Puppy Buyer's for purchasing a Mini Dachshund to be your long life companoin. We want to wish you & your family many years to come with your new long dog. We are so grateful to see all our puppys go the best home's possible and to meet some of the most wonderful new dog owner's ever. From Our Family to Your's Thank you so much. Coco and Jimmys Litter of five girls born 10/6/2010. AKA Katie chocolate piebald sm female no tan points w/ticking. Now living with Kyle, Casandra and her big brother Hercules of El Cajon,CA. 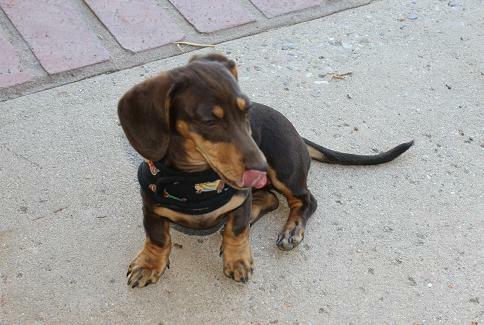 Now living with Cathy @ Fullcircle Dachshunds in Leona Valley,Ca. AKA Missy chocolate and Tan sm female w/white chest & toes. AKA Callie chocolate & tan piebald sm female. Maybalene Rose is now living with the Drangoo family of Bakersfield,Ca. Coco and Degans Litter of 5 born 9/24/2009, 2 boys and 3 girls. Thank you Rebecca Bozzo Of North Hollywood,CA. We just might see Hershey some day in the movies! Chocolate & Tan smooth coat boy. and Oscar her new big brother a doxie playmate! Coco and Degans litter of 4 born 3/10/2009 2 boys and 2 girls. Sophia at her new home. Here's some new picture's of Munchkin She's awesome! of Imperial Beach,CA but will be relocating to Kansas. Kyle & Hercules taking a nap. Hercules on his way to Kansas what a long trip! Zoeys and Logans litter of four. Gracie at her new home she's now the princess of the house. Look at Gracie your getting a new sister soon she will be the princess and you will now be the Queen of the house! Gracia and Sophia new platmates and still waiting for one more sister to be born on June 21 st 2009. Spunky a smooth coat blue and tan is now living with her New Mommy. Bailey a smooth coat blue and tan dapple is now living with his New Mommy & Daddy. Mr. & Mrs. Montgomery of Santa Clara,CA. Cyril a smooth coat Isabella and tan dapple is now living with his New Mommy & Daddy. Mr.Bubb and Cryil playing ball together.